CSGO publisher Valve is to take action to shut down skin betting websites, a statement from one of their business development authorities, Erik Johnson, confirms. 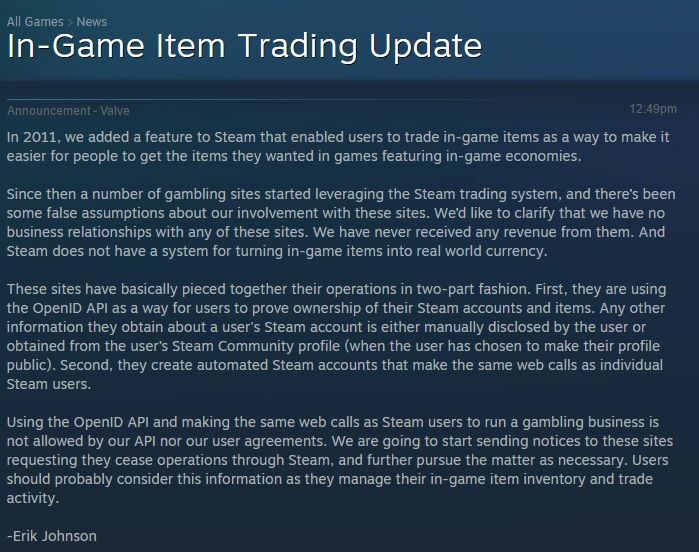 Published on the Steam website, Valve states that “using the OpenID API and making the same web calls as Steam users to run a gambling business is not allowed by [Valve’s] API nor [Valve’s] user agreements”. Further, they state that they will be sending notices to the operators of such sites requesting that they cease operating through Steam and will take further action if necessary. This follows similar action taken by the UK Gambling Commission, which has already issued cease and desists to a number of skin betting websites accepting transactions from United Kingdom residents in recent months. It comes in the light of two class action lawsuits in which Valve is named as a defendant, as they are alleged to have supported illegal gambling activity. The statement also implies that Valve denies that they are involved in the operation of any such skin betting sites, which appears to counter claims that they have assisted with technical queries in the past. Valve’s action is likely to lead to a collapse in the value of CSGO skins which have become a proxy for gambling, which Valve appears to acknowledge as they suggest users consider this move when managing their in-game item inventories. CSGOBetting.com previously estimated CSGOLounge’s turnover to be around $120-240m per year, though with perhaps as much as 70% of activity coming from minors or from jurisdictions where online betting is illegal, only time will tell what impact the skin betting shutdown will have on regulated sportsbooks. It is also likely to lead to a decline in CSGO’s viewership, which grew significantly with the introduction of skins in the Arms Deal update back in August 2013.